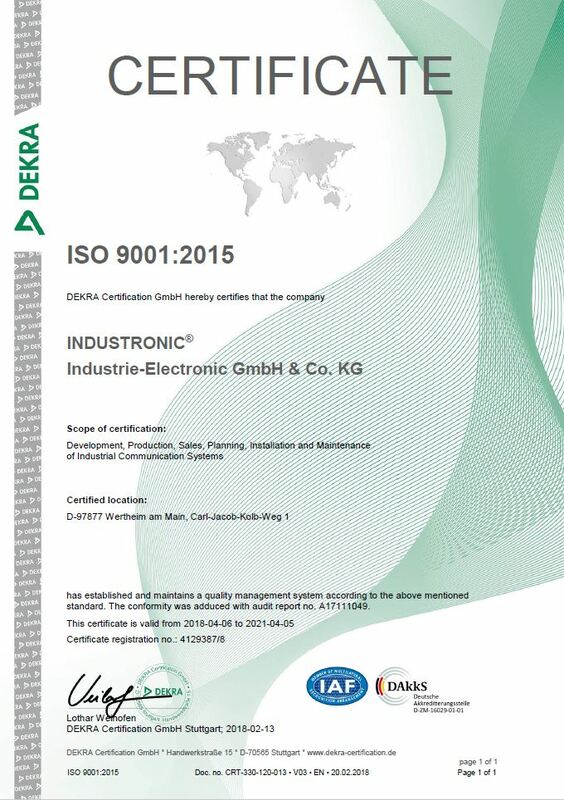 INDUSTRONIC again faced the exciting time of the surveillance audit with the DEKRA Certification GmbH, an independent third party accreditation body, for the ISO 9001:2015. Unlike the recertification audit which takes place every three years, the surveillance audit is a yearly appointment. Therefore in the first week of March, an external auditor visited INDUSTRONIC to ascertain that all our processes comply with the regulations of the DIN ISO 9001:2015. By questioning our employees and managers and examining our processes the auditor declared our quality management system to be working perfectly fine. All necessary requirements were fullfilled and hence the audit was passed successfully. One part of our quality management system, is the customer satisfaction survey as well as having a look at the satisfaction of our worldwide sales partners. To gain more insight in what other people and companies think about us and how satisfied they are with our work, we conducted an online questionnaire. The results were analyzed and discussed with the management during our Customer Satisfaction Workshop. Here, we took our time to reflect on the feedback of our customers. As all answers are highly appreciated and valued we would like to take the opportunity and thank everyone for participating in the survey and for providing us with constructive criticism. The responses, ideas and suggestions of our customers, sales partners, subsidiaries and employees have a great influence on our progress and development as a company.